Meyer Tool’s Solaris® uses patented thermal imaging technology to ensure all cooling holes are present and free from obstruction. With today’s next generation engines pushing the limits of thermal cooling to the extreme, even a single blocked hole can result in premature product failure and a number of other performance issues. 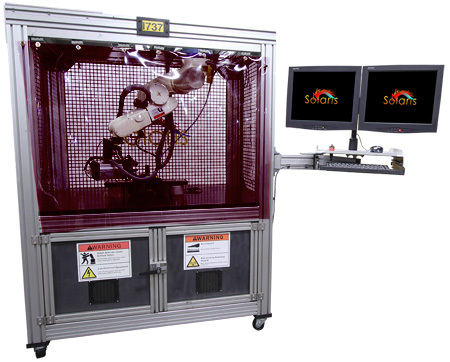 The Solaris system was developed by MTI to automate the cooling hole inspection process and provide our customers with the confidence that their products will perform exactly as they were intended. The Solaris through-hole inspection system uses a revolutionary, proprietary, and patent pending technology to measure the film cooling effect of film cooling holes fabricated in gas turbine components, such as a blade or nozzle. A computer-controlled robotic arm positions a camera in view of a group of holes and then captures a “raw” image. This image is used to produce the “analyzed” image where white signifies the hole and black the skin. This image is used to identify properly formed, undersized and blocked holes.